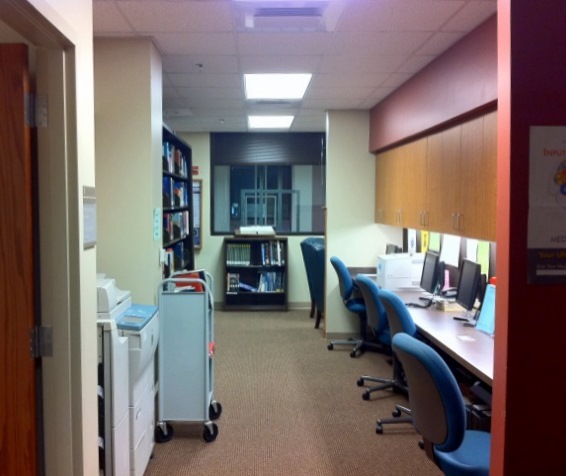 Ever wondered what the inside of a hospital library looks like? Well today I’m going to show you. At least what MY library looks like. 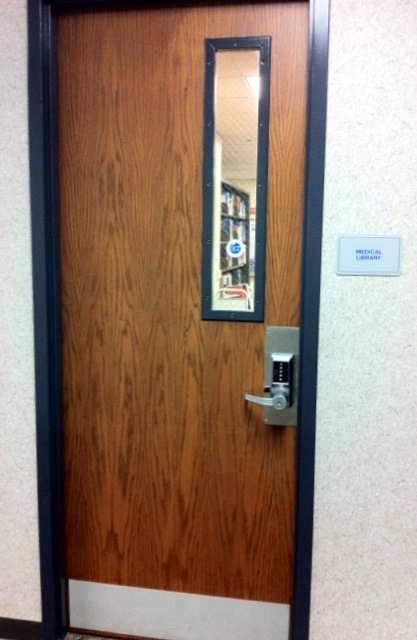 I keep the door open when I’m working, but when I’m not, the physicians can still access it via the door code. The library is accessible 24 hours a day to anyone with the code. The view right as you walk in. 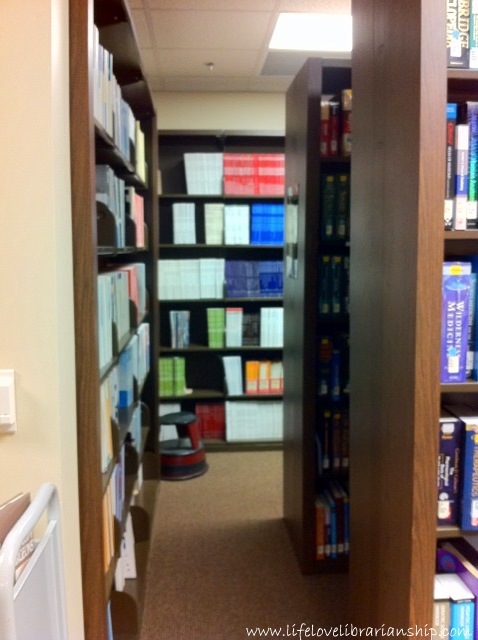 To the left is my office and to the left is a display shelf with all the latest print journals. Four computers and a printer. Computers (and really the library in general) are only open to hospital staff. 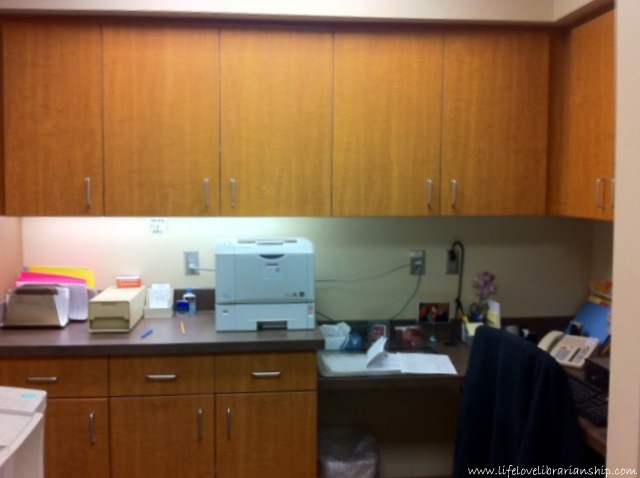 I will sometimes allow volunteers to use the computers if we aren’t busy, but patients are never allowed to use the facility. 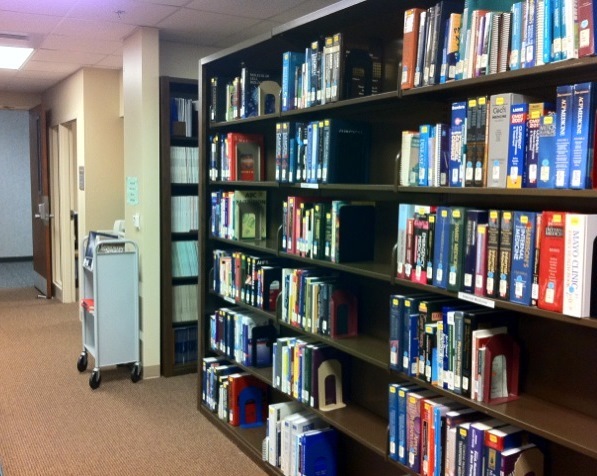 This is a true research library. This is the only real study space I have, much to my chagrin. The furniture is leftover from the old library, uncomfortable, out of date, and it doesn’t match at all. I’m always embarrassed when I have to give tours, but that’s what happens when you spend all your money on providing good resources rather than decorating. This is directly across from the little study space. You are looking at the back part of my print journals and the two front shelves (both are two sided) that hold the book collection, which is about 600 volumes. A better look at part of my book collection. The books are classified in the NLM scheme, which confuses the doctors, so I provide little labels under each section to make it easier for them to find what they are looking for. The other side of the front book shelf. Along the left and back sides are the journal collection. I keep (mostly) the two most current years in the library and the rest of the run (if I have it) in my storage space. 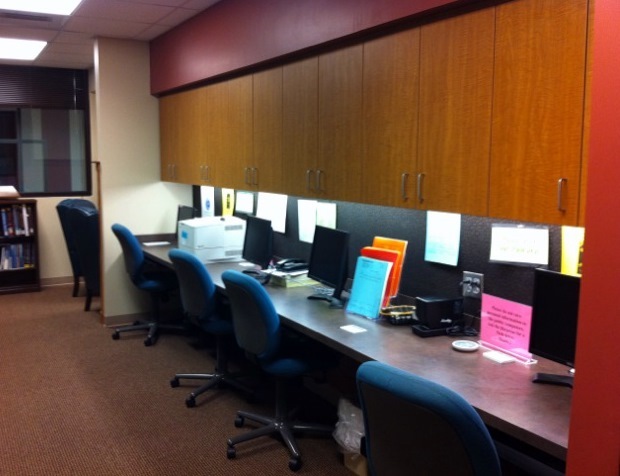 To the far left (out of sight) is the copier and “please-get-them-out-of-here-because-they-are-super-old” books. The other side of my office from my desk. This is the work station and the library assistant’s desk. She only works two days a week at my library which is handy when you have to share an 11×13 foot office. It’s tiny for two people. Thanks for stopping by my library for a visit! What do you think? We’ll have to stop by when you’re in town. 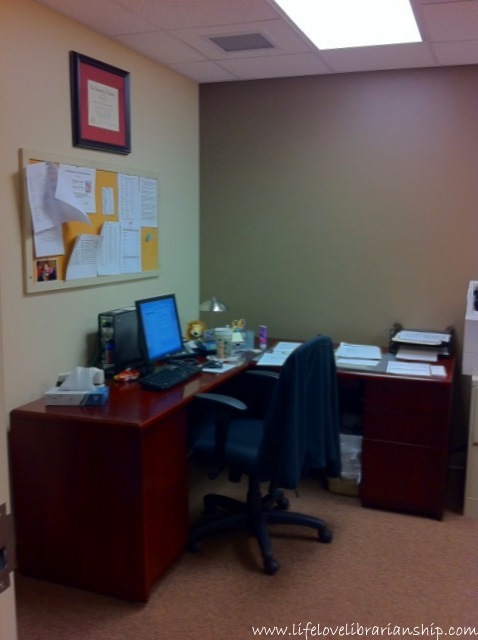 The size of the office is deceptive. I feel like it’s about half the size of our room in New Hall. oh, how nice! thanks for the peek! i spotted an Alphie & it made me happy. Yep. 🙂 I can’t have a space that doesn’t have one. I always wondered too! Thank you sooooo much 😀 I feel like I just got introduced to a big part of your life! It’s where I spend most of my time unfortunately. I should have pointed out the lack of windows as the reason I’m always so grumpy lol. 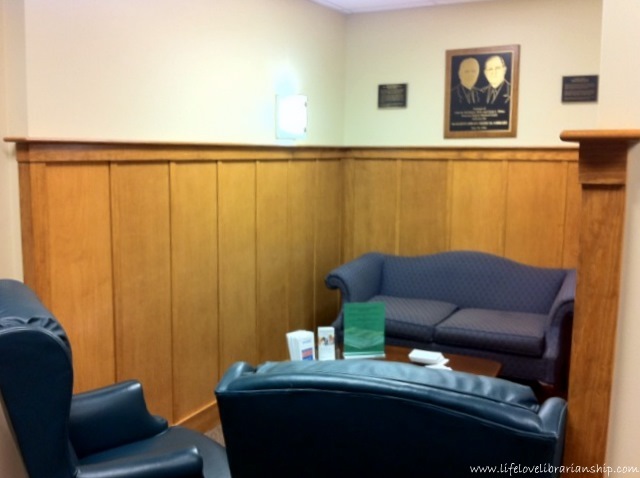 I’ve never seen a medical library before, so this was really interesting! It was nice to get a peek at the office where you spend your days. 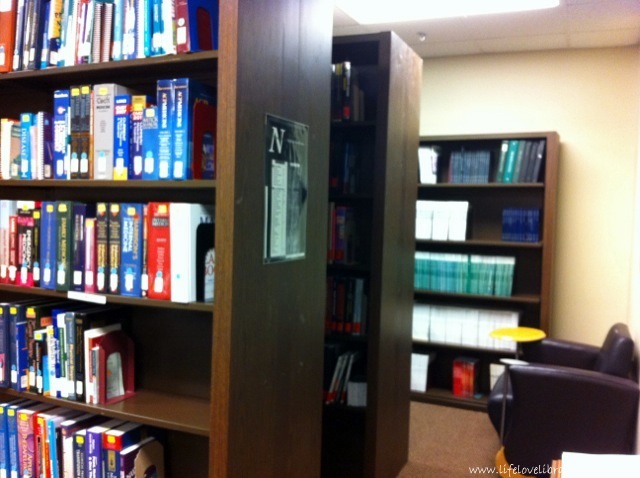 Every library is so different, I thought it would be fun to offer a peak into mine. I think it helps people understand what I do better. This is very neat! I have to admit that I don’t know much about medical libraries, but this looks very well-organized & I know that your doctors appreciate it. 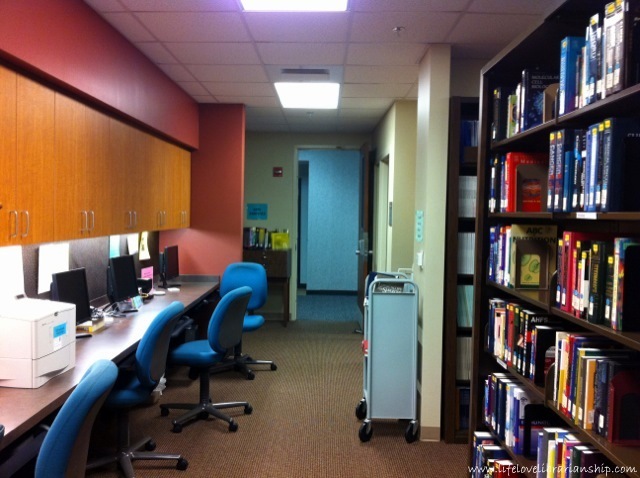 I didn’t know anything about medical libraries when I started either. I really lucked into the job and learned everything on the job. It’s not all that different from an academic library, just the needs are a little more pressing than a student writing a paper. It’s a great place to work though. Previous post: What Am I Saving For?